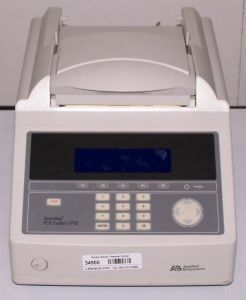 Product Description This Dual 96-Well GeneAmp PCR System 9700 is specifically designed for reliable PCR. It contains two sample well blocks; each holds a maximum of 96 samples. Fully loaded, the instrument accommodates up to 192 samples per run. The system can also be used with a single 96-well block for smaller runs. This sample block module provides increased thermal cycling capacity while maintaining a 0.2mL format for PCR. The system is an ultra-reliable, highly versatile thermal cycler designed for medium to high throughput DNA and RNA applications. Interchangeable sample blocks let you quickly change throughput and well volumes to match your applications. An intuitive graphical user interface with comprehensive programming features and real-time display makes your protocol setup fast and easy, and precision-engineered sample blocks and Applied Biosystems MicroAmp disposables ensure optimal thermal response and reproducibility. You can also add networking and data management capabilities, validation options, such as the temperature verification plate, and an automation-compatible plate ejection system.